A designer from Cardiff has hit the right note with her protective sleeve for trumpets which keeps the instrument warm in cold weather. 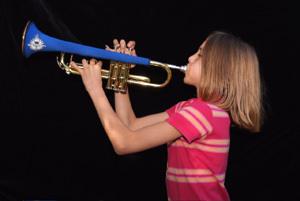 Ali Kedge devised the Warmahorn as an accessory for young musicians to decorate and protect their trumpet. She also found that the sleeve made of wetsuit fabric helps improve the tone of cheaper instruments in all weather. Orders for the product have come from individuals and stores across the UK and Holland with two major pop acts also showing an interest. Ali, who works as a costume designer, came up with the idea after seeing trumpeter Jonny Bruce struggle at a cold outdoor gig with her jazz singer daughter Ruby Samba. At Ruby's suggestion she made a little coat out of fun fur for Jonny's trumpet which soon became a hit with other musicians. One of the UK's leading jazz administrators praises a "territorial army" of volunteers who ensure the music survives despite spending cuts. Chris Hodgkins, director of Jazz Services UK, shared his thoughts as he returned to Wales for a short tour. The Essex-born trumpeter grew up in Cardiff and helped launch the Welsh Jazz Society before moving to London. He says politicians need to treat volunteers with respect if they expect them to make up for cuts in grants.